Swindon based BGA is the automotive aftermarket division of The British Gasket Group, and is dedicated to servicing the automotive industry with an extensive range of products. Containing more than 33,000 references, BGA’s comprehensive product portfolio covers Gaskets and Gasket Sets, Engine Valves, Camshafts and Followers, Oil and Water Pumps, Head Bolts, Crankshaft Vibration Dampers, and Timing Chain Kits. BGA’s high volume throughput of flexible and semi-rigid materials is processed with the help of a range of the latest CNC travelling-head presses and power presses. This advanced technology allows the production of almost any type of flexible or rigid gasket, in any volume and material. The company also use state-of-the-art multi-dimensional laser cutting and profiling machinery, whilst water-jet cutting is used on materials such as graphite and composites. Accredited to the automotive quality standard IS0/TS16949, The Group’s highly developed quality ethos is in evidence throughout BGA’s impressive Swindon plant. In addition to maintaining strict adherence to the company’s quality culture, BGA’s staff has access to a wide range of impressive inspection equipment. Although some of BGA’s more specialised material testing tasks are sent to local specialised testing establishments, as volumes dictate, the company purchases the relevant equipment to enable these inspection routines to be brought in-house. 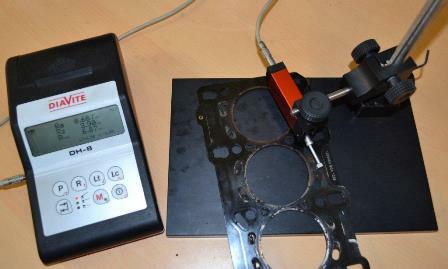 An example of this course of action is BGA’s advanced Surface Roughness tester recently purchased from Bowers Metrology. Matthew Greener, BGA Marketing Director explained; “When feasible, our aim is to make BGA’s inspection activities as autonomous as possible so that we are able to receive instant feedback of any potential problems. Brought about by our increased manufacturing volumes, our need for an accurate in-house method of measuring surface roughness recently became apparent. “On searching for a suitably precise surface roughness tester, which was portable enough to be transported to all areas of our large facility, and able to withstand use on the shop-floor, following our investigations, we determined that Bowers’ Diavite DH-8 tester was the ideal choice. In addition to providing the required accuracy the Diavite DH-8 proved extremely robust and easy to use. UK agents for the renowned Diavite range of surface roughness measurement instruments, Bowers claims that in spite of the portable unit’s compact size and cost effective price, the powerful instrument is capable of performing countless, extremely accurate surface roughness measuring routines. Tolerance indications for measurements that exceed permissible values are able to be user defined, whilst a key lock can be set for lt, lc and R, preventing settings being mistakenly changed during a measuring procedure. In addition to the new Diavite unit’s high-quality integrated printer, the DH-8 has a USB output for convenient data transfer, whilst a Bluetooth option also permits measured data to be transmitted wirelessly. Adding to the flexible instruments versatility, a wide choice of tracers and useful accessories ensures that the new Diavite DH-8 is able to solve the vast majority of industry’s surface roughness measuring tasks. For more information on the Diavite DH-8, click here.